Here Mr. Kimmelman emulates the Lushi verse form with parallel imagery (flowers and leaves) in successive couplets and the same number of words (3) and syllables (4) in each line. Chinese words are monosyllabic, so in a Chinese line of verse the number of words and syllables are the same, and each of is represented by its own character. Most English words are polysyllabic, so Anglophone poets can only approximate Chinese prosody. Most of the poems Mr. Kimmelman has written since the turn of this century have employed syllabics. Unlike many of his contemporaries who emulate Japanese syllabic forms that vary the number of syllables per line, such as haiku’s 5-7-5, Mr. Kimmelman emulates Chinese verse forms in which each line of a poem has the same number of syllables; at least one of his syllabic poems has only three syllables per line, a few have as many as eight, and most have a number in between. Basil King, some of whose brushstrokes resemble those of traditional Chinese painters, illustrated this handsome paperback with black and white reproductions of his abstract paintings. His use of enjambment in this and many other poems in this laudable book is masterful. They fall into three thematic categories: nature poems, ekphrastic poems describing visual art works, and poems that depict scenes of family life. A few poems describe life cycle ceremonies such as a bar mitzvah or a funeral. Religious rituals notwithstanding, these are secular poems without mystery: what you see is what you get, or rather what the poet perceives is what the reader gets. Mr. Kimmelman provides descriptions but often, especially in his more recent poems, does not impose meanings, thus allowing his readers to reach their own conclusions. His poems are much more accessible than those of the postmodern poets he quotes in many of his poems’ epigraphs, but he and they would probably agree that any and all interpretations are valid. 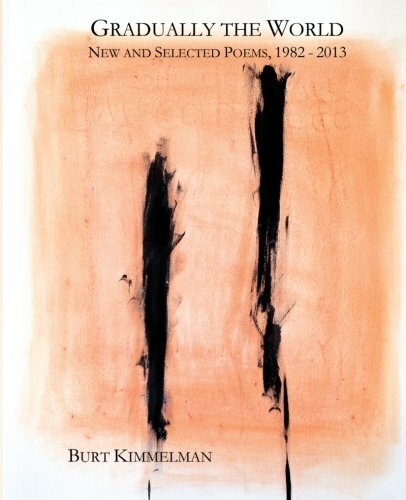 Mr. Kimmelman’s “New Poems, 2011–2013” comprise the first section of the book, followed by selected poems divided into three sections: 1982–1992, 1993–2002, and the final and largest section 2003–2011. The book thus begins and ends with mostly syllabic poems from the past decade sandwiching his earlier poems in between. “You never learned how children keep our time. love, how the photograph becomes memory.